Readers who have followed the An Unlikely Husband series have only seen Holt Langford and his wife, Sophie, as the model couple: married, in love, sharing their hearts and dreams. However, there was a time when they didn’t share much of anything…and certainly not plans for a life together. You won’t want to miss this tale of scandal and seduction as the Earl of Westover falls for the daughter of his family’s sworn enemy. It’s going to be a hard fall, fraught with denial, hurt, and revenge, yet the ultimate gift will be love, hope, and enough dreams to fill an earldom. 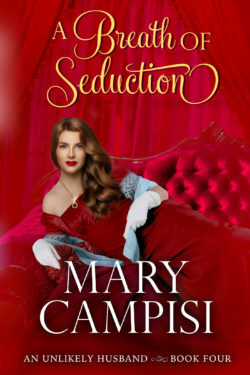 A Breath of Seduction was previously published as The Seduction of Sophie Seacrest.